Bloodborne’s first major boss is the Cleric Beast. Let’s do it. 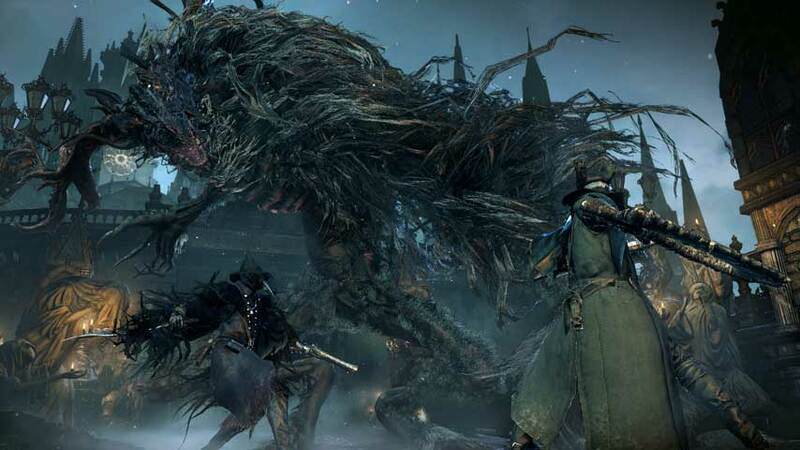 The Cleric Beast is Bloodborne’s first real challenge, apparently. You are permitted to weep a little at this stage. To be honest, it’s less traumatising than the trek you’ve just made; there are no Netherbeasts. If you are successful – when you are successful – you’ll earn the Sword Hunter Badge. This boss isn’t required to finish Bloodborne. If you really can’t handle it, feel free to continue on to the next section of the walkthrough. The second boss is mandatory. While the Cleric Beast is scary looking, it’s not too hard to kill. Its attacks are surprisingly easy to dodge: get reasonably close, and then when it winds its arm back, circle behind it and give it a good smacking. While you’re lurking behind the Beast you won’t be hit by any of the boss’s major attacks; you may take a few minor hits as the creature turns, but you can Regain the lost HP by attacking swiftly if necessary. It’s far more dangerous to stay at a distance in this battle; the Cleric Beast has a jumping attack which can be deadly. If you see the beast leap, pause, and then dodge; it will land exactly where you were standing. Don’t just start dodging immediately, or it will get you anyway. You’ll see what we mean, probably. Unfortunately, it’s not as easy as it seems at the start: once you’ve inflicted plenty of damage on the Cleric Beast it becomes enraged. You need to back off now: the Beast’s swiping and ground pound attacks both require you to stay at a longer distance – be aware that the Beast can inflict damage while withdrawing its hand from the ground after the slam, so don’t rush in too quickly. Happily, the Beast will eventually calm down. When its tantrum ends, go back to paddling its bottom on the regular until it falls down dead. Note that in this final stage the Beast has one more clever trick; if you stand directly in front of it, it will grab you and give you a very nasty whack of damage from which it’s difficult to recover. All in all, the greatest threat in this battle is the environment; it’s annoyingly easy to get stuck on the geometry, at which point the beast will have you pinned and hurt you very badly. You can easily stun the Cleric Beast by targeting its head (lock on and flick the right analog stick upwards) and firing three times. It will drop to its knees, and you have a very short window in which to Visceral Attack it in the face. This is significantly easier than getting the timing right for a standard Countershot set up, but is very difficult if you don’t have a firearm with decent range, as you need to get the shots off quickly. After defeating the Cleric Beast you’ll find a new Lantern, which you should activate immediately, even if you don’t want to go back to Hunter’s Dream right now. On to Part 03: Central Yharnman to Father Gascoigne.